You may have heard Toku (and umai) now have the best tasting Hakata Tonkotsu Ramen this side of the Nakasu River, but there’s also been some other pretty amazing additions to their menu we’re sure you’re going to love. Launched March 19th, Toku’s unique Japanese Afternoon Tea experience is a combination of the beautiful English tradition of tea with a Japanese twist. 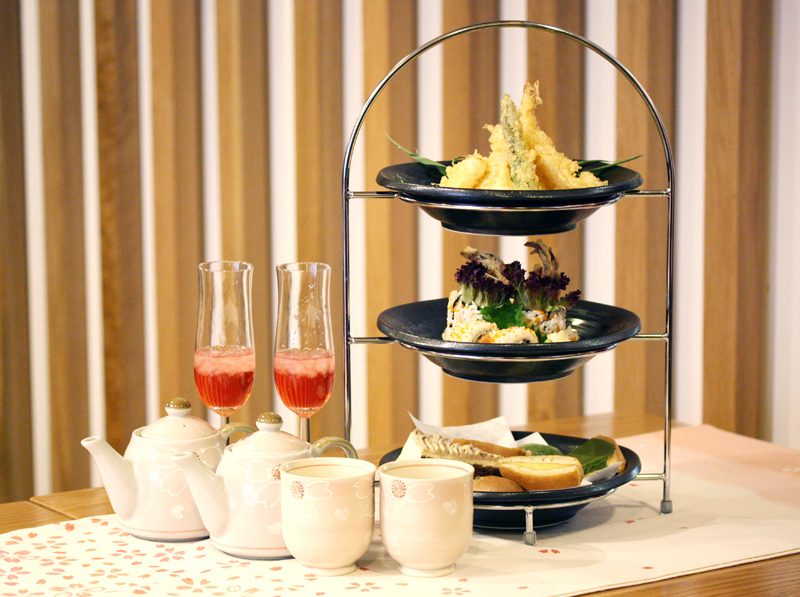 Our Japanese Afternoon Tea menu is comprised of a tier of Toku’s signature Tempura, with a 2nd tier of delicious hot smoked salmon sushi to follow. To finish we have specially made Japanese patisserie to share such as matcha, marron chestnut and mochi desserts. Leisurely enjoy these delicate flavours over a cup of high grade green tea fresh from Japan. This is a fantastic experience we urge anyone who loves Japanese cuisine to try and would be perfect for Hen Parties, Birthdays and celebrations! £20 pp / £22 for umeshu cocktail option pp. Book your Japanese Afternoon Tea experience online. 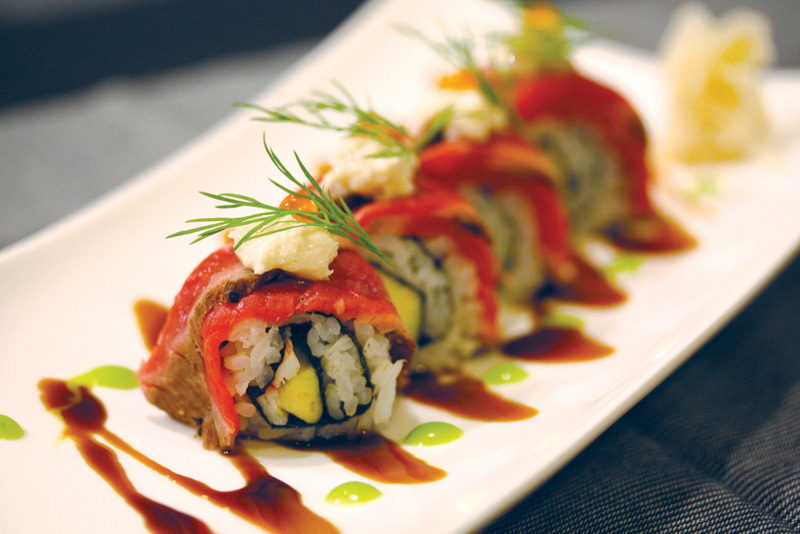 Seared beef topped avocado and prawn inside-out roll with a hot horseradish, wasabi and dill top hat. New to Toku is our Dynamic Sushi Menu, Head Chef Furukawa san has been hard at work conjuring up new-generation sushi plates with exquisite flavours. Inspired by unique Asian ingredients such as yuzu and gochujang, whilst paying homage to British eccentricity this menu is a jewel in the crown for Toku and fast becoming our customers’ go-to menu of choice. shiso herb and tobiko sprinkled squid, prawn and scallop gratin balanced on hot avocado and prawn sushi rolls with a wasabi mayo dressing, a new sushi experience. 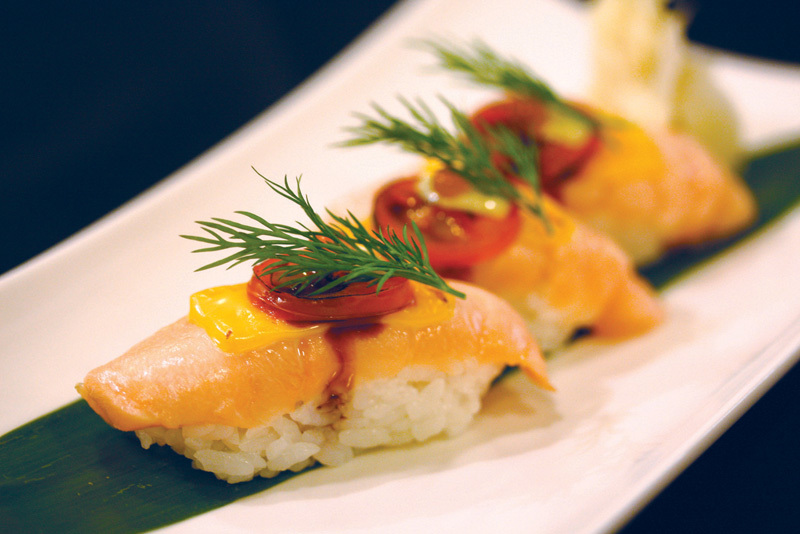 seared salmon nigiri topped with melted cheese, cherry tomato, ikura salmon roe, fresh dill and a delicate dash of teriyaki sauce & wasabi mayonnaise. tobiko covered inside-out roll with a soft shell crab crown, lettuce and mayonnaise. seafood gratin of squid, prawn, scallop, yellowtail, edamame and mushroom on rice, with a melted cheese, hot horseradish, tobiko and teriyaki sauce. Served in a beautiful hot ceramic dish. the highest quality cooked smoked salmon from the Scottish Isle of Ewe, combined with soft cream cheese and lettuce fills this inside-out tobiko coated roll. 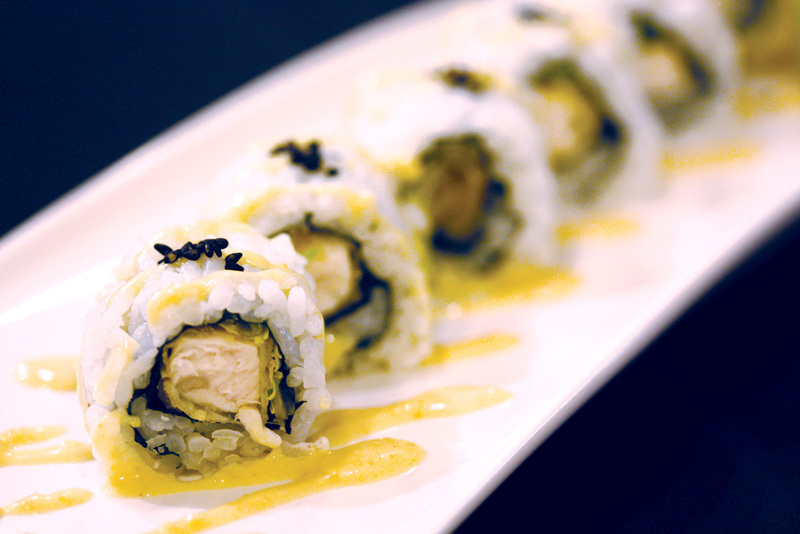 fresh, light flavours of crisp yellowtail tempura in an inside-out roll, drizzled with a zesty yuzu-citrus and mayo dressing. fire up your taste buds, an inside-out roll filled with fresh tuna and drizzled with a fiery hot jalapeño and gohujang spicy miso-mayo dressing. an inside-out sesame coated roll, containing blanched king prawn and ripe avocado,wrapped with smoked salmon from the Isle of Ewe and delicately topped with shining ikura (salmon roe). 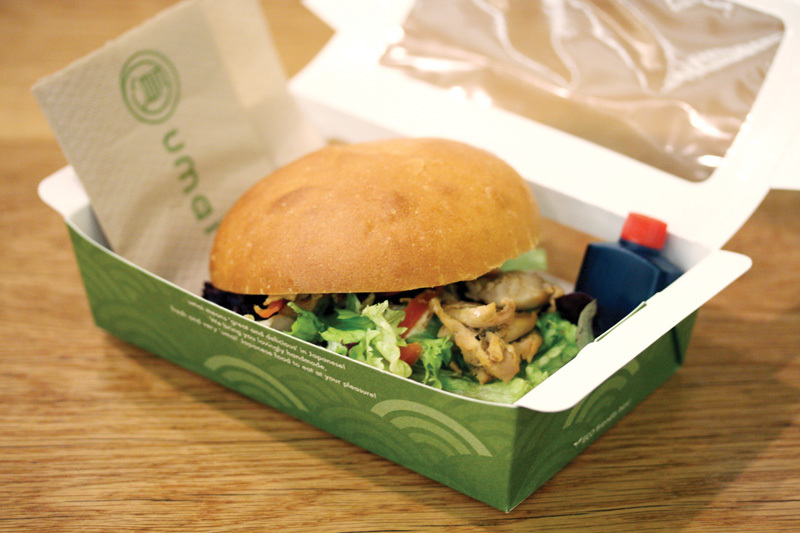 Made using soft sesame buns baked in our own Japanese bakery, succulent chicken teriyaki, salad and Japanese mayonnaise fills this modern-Japanese burger (extra teriyaki sauce | spicy version available). 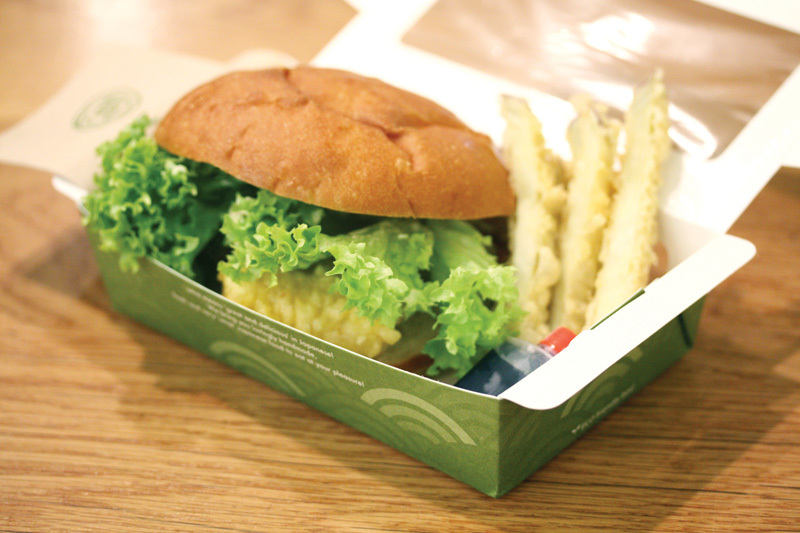 Again using soft sesame buns baked in our own Japanese bakery, crisp salmon tempura, salad and Japanese mayonnaise fills this modern-Japanese burger accompanied by sweet potato tempura fries. Want restaurant quality but pushed for time? Our new ‘My Set’ combines the best umai favourites in one feast! Creamy and rich authentic Tonkotsu Ramen noodles made with ingredients brought all the way from Japan, three mouthwatering gyoza dumplings of your choice (chicken, pork, prawn, beef, salmon or veggie) AND and a portion of organic white or brown fried rice. Individually these have already earned umai customers’ hearts and together they make what is quite possibly the most fantastic on-the-go meal we’ve ever seen! 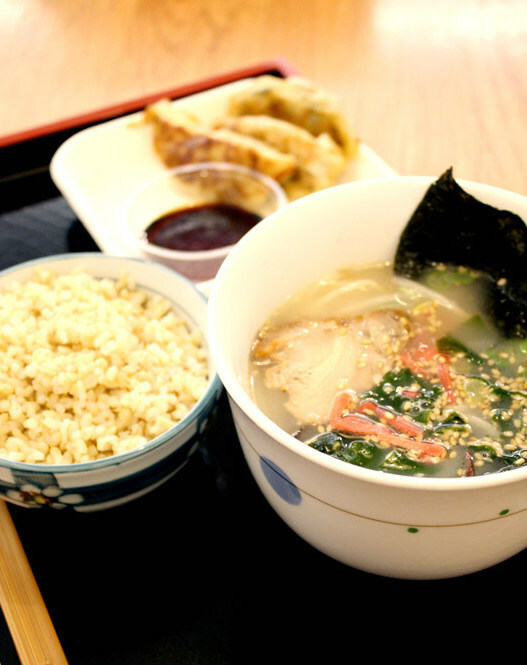 Suddenly got a hankering for Japanese food? Well who wouldn’t after reading that! 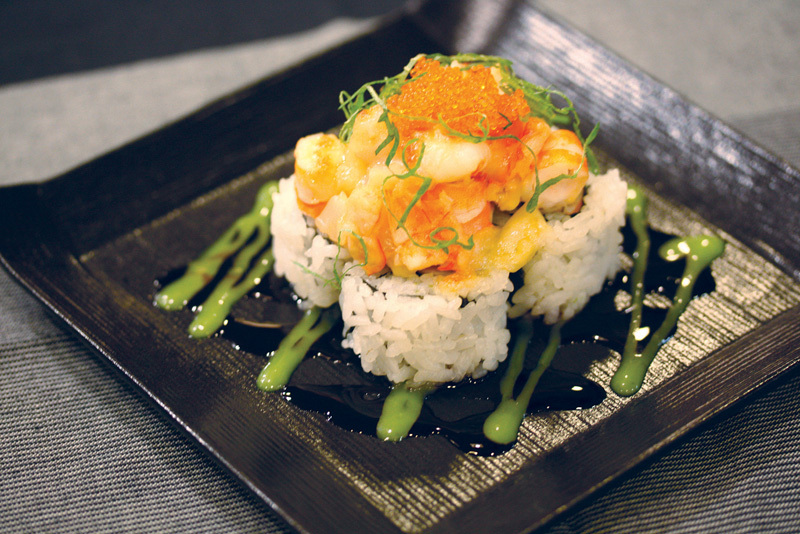 All of these dishes are now available at Toku Restaurant and umai, so what are you waiting for? Hurry over to Japan Centre pronto to experience tastes of Japan without having to fork out for a plane ticket to the Far East! Posted in Uncategorized and tagged japan, sushi. Bookmark the permalink.